Here you’ll find some ACA 101 material that will help you begin to navigate ACA requirements if you have 50 or more employees. Make sure you check out the plain English ACA 101 guide for Applicable Large Employers (ALEs). If there’s one thing to know, the reporting requirement should probably be your biggest concern right now. If there’s a second thing to remember, it’s to ensure your 2016 plans are in compliance with ACA to avoid penalties next year as transition relief ends for plan years beginning 1/1/2016. Explore the resources and timeline below. 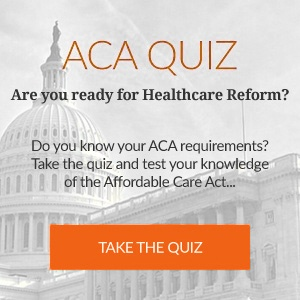 Want to see how much you really know about ACA? Take our ACA Interactive Quiz to test your knowledge and learn some valuable facts about how it might impact your business. Can I Reimburse my Employees for Health Insurance? Partnering with a PEO can help you and your team stay focused on what you do best.